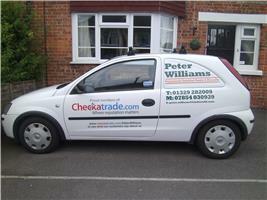 Peter Williams - Painter/Decorator based in Fareham, Hampshire. I am a Professional Qualified Decorator with 32 Years Experience in the trade. I complete all jobs to a high standard with a personal touch to ensure high customer satisfaction! My aims are to make sure that each customers requests are met on every job I complete no matter what. I have been a sole trader for the last 12 years and being a sole trader means No VAT payable. I specialize in internal wallpapering & painting also external painting. My main areas of work are Fareham, Gosport, Lee-on-the-Solent, Portsmouth, Southampton & Winchester. Fully Insured. CRB Checked. Construction Skills Certification Scheme registered and qualified. Thank you for taking the time to read my page today and I look forward to receiving your call!